Designed for network administrators to quickly diagnose problems during LAN installation and repair. 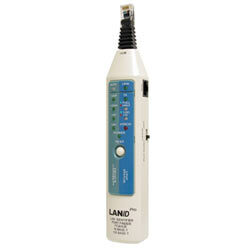 With a simple push of a button, the LANID Pro will display the status of network devices, whether it is running a 10BASE-T or 100BASE-T network. Equipped with Portfinder function to quickly identify the corresponding port location on the Switch/Hub. Cct design provides the user with optimum convenience and portability.